Where to visit in Kyoto? The technical program has been updated also in this official HP. The technical program is being rescheduled according to the requests by those speakers who expect late arrivals in Kyoto. Hereafter, throughout the symposium period, we will load the revised technical program at http://ckatolab.iis.u-tokyo.ac.jp/Program-0913.pdf. We will send out an email to all the registered participants that informs the updates of the technical program. In case your flight to Kansai Airport is cancelled, we would suggest an alternative flight to Osaka (Itami) Airport, via Tokyo Narita (or Haneda) Airport ; it is most convenient. IAHR 2018 will be held as scheduled, since the damage caused by 21st Typhoon, Jebi is limited in Kyoto. However, Kansai International Airport is seriously damaged and some flights might be canceled or diverted　to other near-by airports. So please check your airline about your flight. Condition of Kansai International Airport https://www.kansai-airport.or.jp/en/ as of Sept.11. Runway #2 and Terminal #2 are under service since Sept.8. Runway #1 and Terminal #1 will be made partly in use from Sept.14. This symposium is going to be held as scheduked. The preparation of IAHR 2018 is under progress as scheduled irrespective of some damage on the area caused by 21st Typhoon Jebi. However, Kansai International Airport (https://www.kansai-airport.or.jp/en/ ) is currently (as of Sept.7) closed for international flights and the flights　may be diverted to other airports. So, please contact your airline to get the information about your flight several days before your flight. Program book has bee updated. Program overview and technical program have been updated. Program overview and technical program have been uploaded. Acceptance notification of revised paper has been sent to the authors. Some papers are still under the review. We are sorry for that. Please submit your final manuscript by July 27. Please check if your manuscript properly follows the instruction, before submission. Acceptance notification of draft paper has been sent to the authors. Some papers submitted after April 30, 2018 are now still under the review. Accommodation site is now available. Hotels in Kyoto are rather crowded. We strongly recommend you to book a room as early as possible. The official deadline of draft paper submission has already passed. The authors who have not yet submitted their draft paper are requested to make it by April 15 at the latest. Due to the large number of the submitted Abstracts and expected papers, the schedule of the whole conference has been changed and it will start on September 16, one day ahead of the original schedule. Draft paper submission is now available. Please go to submission page and upload your draft paper by March 31, 2018. Please note that the page limit is 4 -10 pages. The abstract notification e-mail has been sent to the all submissions. We are sorry for our late notification, which may result in your inconvenience. If you have NOT yet received it, please let us know. The submission of abstract has been closed. 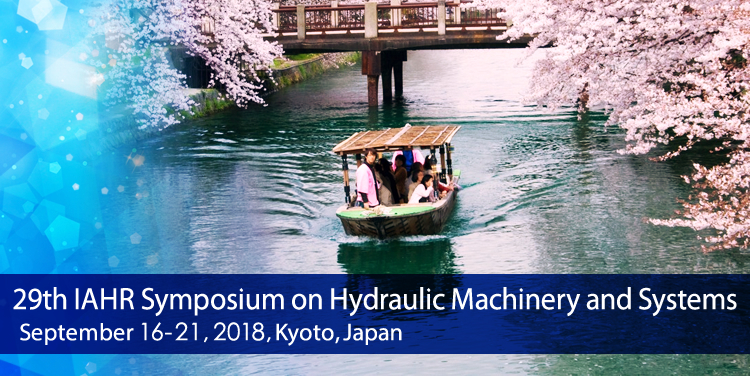 The deadline of abstract submission is extended to January 15, 2018, 24:00 Japan Time (GMT +9). New organized session “Pumps Working As Turbines (PAT)” is added. For more detail, see “Scope and Programs”. Information on workshop 2 “Single- & Multi-Stage Pump Flow Prediction” has been updated. The final stage model of original target pump is added as a numerical model. For more detail, see “Scope and Program”. Abstract submission site is now available. The deadline is November 30th, 2017. We will welcome for your entry. Please enter the submission site from “Submission” menu. 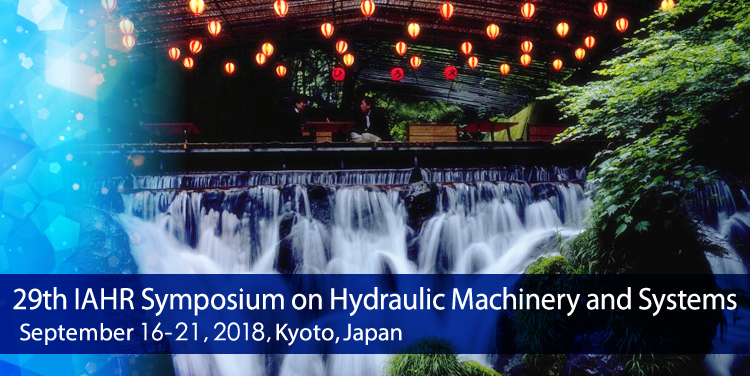 We are happy to announce that the next Symposium on Hydraulic Machinery and Systems will be held in Kyoto, ancient capital of Japan, in September 2018. Hydraulic machinery and systems are the key components for the sustainable development of energy and water resources including various transport process of liquids. 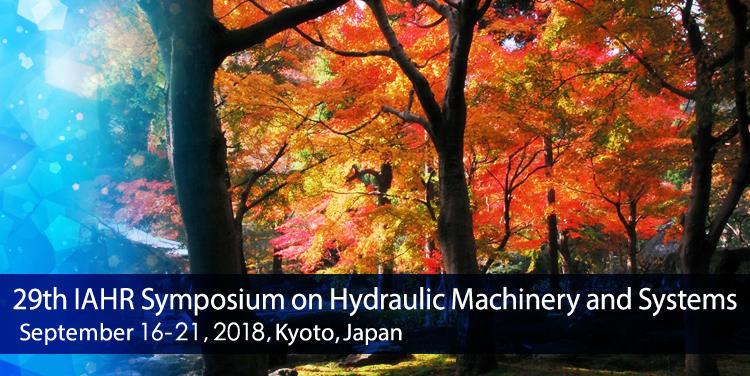 For more effective and efficient utilization of hydraulic machinery and systems, it is important to exchange up-to-date information on R&D, Numerical Analysis, Design, Operation and Monitoring of hydraulic machinery and systems. 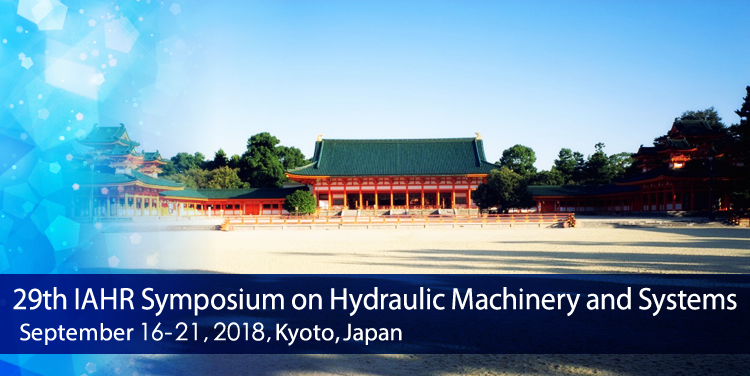 IAHR 2018 in Kyoto offers an opportunity to gather scientists and engineers from all over the world to discuss the most recent advances in theoretical, experimental and computational research as well as the latest challenges faced by the industry. We hope that IAHR 2018 also provides the occasion for you to visit one of the most attractive towns and regions in Japan. Copyright (C) IAHR2018 all rights reserved.